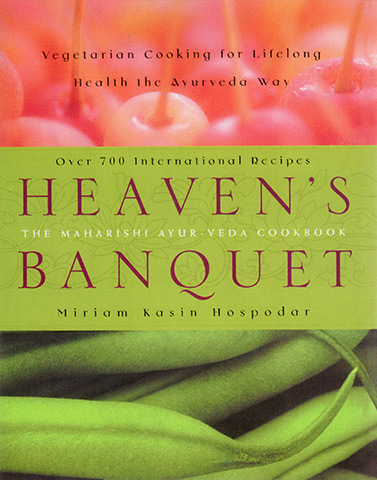 Fully illustrated, and inclusively written for everyone from the beginner cook to the experienced chef, Heaven's Banquet shows how to incorporate the timeless principles of Ayurveda into the twenty-first-century kitchen, and how to create life-long health by using food to tap into your body's intelligence. The book draws from a rich palette of international cuisines collected during author Miriam Kasin Hospodar’s twenty year culinary journey. It clearly explains the ayurvedic principles which enable you to match your diet to your mind-body type, allowing you to attain your maximum levels of health and well-being. In it you will find over 700 delicious recipes, ranging from Thai Corn Fritters and Asian-Cajun Eggplant Gumbo to West African Avocado Mousse and Mocha-Spice Cake with Coffee Cream Frosting. Readers will discover the most effective methods of preparing food, the benefits of eating seasonally for individual types, and learn how to create a diet for the entire family. It contains special sections on how to lose weight and control sugar sensitivity, a questionnaire to help determine mind-body type, and a list of essential ingredients for the well-stocked Ayurvedic kitchen. Born and brought up in Berkeley, California, art, writing and music have been important to Miriam her entire life. She went from demonstrator and protester to an exponent and teacher of transcendental meditation. She has worked as a chef in France and Switzerland and roamed through temples and holy places in Southern India.